I saw that you replied to my moapatchman-post - it's a pity that this post is lost now. I really liked your works, would you mind posting it also on boot-land.net? I'm sure more people will take interest in it once they see how it can be used - it's really a nice idea to make things so acessible this way. I was concerned about support for qemu althought I figure that few people oughta have tried it - but this would be an awesome addon since qemu is very small sized (1Mb) and it's free to be distributed. Some time ago I've exchanged talks with Fabrice Bellard the author of qemu when I was working on batcher and asked his permission to distribute qemu - he was very interested in helping with testing at the time. If needed I can ask his assistance to help on this task, what do you think? I forgot one thing - I will have to do an automatic patch translation when the offline -windows does not use controlset001 but a different one. When I implemented that I will show it to you. Then I realized that you must have related to the 5 screenshots on my site. - you got it - why not do that stuff with quemu as well ??? Doing things like described in that 5 screens is quite new grounds - I often feel bored cause nobody gets it and pushes me a little bit. If you want to help in making this easier - maybe even with quemu - hey you are very welcome. At the moment I want to get the patchman going soon. The patchman is so to say a frontend for xcopy and regedit. When you start it - it reads a ini-configured directory for subdirs 0 -99. Depending on the stuff you put in the subdirs patchman runs thru 2 upto about 12 stages and runs predefined actions. If your subdir 37 exists - patchman reads a ini you put in that dir to desplay a description. If you add a files dir to subdir 37 all files in that dir will be xcopied to targetroot. If you add a expand.cmd into that dir patchman will launch this expand.cmd that can be used to extract files from cabs in targetroot. This procedure is in no way VMware-related - so I can't follow your quemu-sorrows. Well, well the world is really small! I just came here to PM nuno about sanbarrow's post on the 911CD forum to invite him to Bootland, and here he already is. Nice little thingie you have going. After wb053 is completed I will proceed with testings to see if it possible to boot the installed OS using patchman and qEmu. Good luck with the patchs and thank you for posting! I'm not so involved into quemu - can you use REDOlogs similar to VMware ? That's the thing that makes this so interesting : you can start the local system as a VM but you do not actually change anything on the local disk. From what I know about quemu this is not possible - though I would like to hear that I am wrong with this assumption. vmware seems to be the prefered method but I think we can still use qemu through direct disk acess to trace diagnostics and understand why it won't boot - or even try to fix it and see if it will boot.. Strange enough that I've been googling also for scsi drivers to use on qemu but I get no findings unless when comparing against vmware wich seems really dependent of them. Perhaps it's not even needed to inject these scsi drivers using qemu? My experience with p2v is quite limited but I think these are probably good conditions to sucessfully achieve this P2V with qemu, can you please try it? sanbarrow, you have a good project going there and I tried to follow it since you posted it at the 911CD forum. I tried to follow the steps at one time but it over whelmed me and I gave up. From a quick scan thru them I get the impression that one aspect is missing in the quemu-approach: it looks like you first have to create an image of the physical disk. Once you got that - you can use a similar technic to what I do with VMware. I create the raw-disk descriptorfile (which is a small textfile of 1kb), I then attach a REDOlog to this disk and store it in RAMdrive and mount it. I patch it with IntelIDE-drivers and registry-settings. now the REDOlog maybe about 2MB large - cause only the changed files are stored in the REDOlog. Next I use this raw-disk - REDOlog chain in a virtual machine and launch it. This is the project in the net that is somehow closest to what I do - though this guys still use an image of the physical disk. Nuno - you posted a link to a vmx-file creating wizzard - this vmxwizard is crap - completely outdated and partly wrong ... do not even consider useing it! when it launches it does a quick-scan thru the registry of the offline-Windows and detects OS, servicepack level and so on. Can anybody give me a hint who I can display which driver is used for the mass-storage needed on boot ? I'm a bit rusty with VMware Disk formats, if I am not mistaken they have a header of some kind, and then they are just RAW. Do you happen to have any links/specs of the VMware formats? Jaclaz - that is the raw-disk description for a 34,74 GB raptor-ide-disk. Only thing I need is a way how to read the value for the extent description - in this case it is 72303840 - from the MBR. VMware has published the specs for their disks - I'll look up the link or can send you the pdf directly if you do not want to register on the VMware-site. I can also send you a couple of MBRs together with the descriptorfiles if that helps. Can anybody help me with an autoit-problem ? lol! Thats a compliment from them. VMware wants that users do not fiddle with vmx-files as this can produce lots of hard to find problems. That is ok - I agree with that. It would be ok - if almost all settings that a user will ever need would be available via the GUI. Nowadays the GUI covers only about 50% of the options that are necessary in daily use. So VMware forces the user to fiddle with the vmx-file - inspite of the fact that they do all to disencourage this. Their logic goes on like this: users should not fiddle with the vmx-file - so we better do not document these parameters on our own website - as our stupid customers would make so much errors with hand-editing this file that the workload on our support would increase a lot. Just take one example - nowadays Workstation can use a virtual Intel E1000 Nic. This is much better for some guests than the default AMD or VMXnet device. As the user can not set this via the GUI in a simple way - he either can not use this advanced option at all - or he has to google strange sites and fiddle with the vmx-file again - completely stupid attitude. I offer cooperation to VMware on this vmx-documentation since almost 3 years: I asked them - leak some information on the useful parameters and I will remove all the really dangerous stuff. Result - I once got a list of very-dangerous parameters that can seriously mess up system performance - that's all. Thanks for the clarification. It makes more sense now. If I am not wrong, that number is the total amount of sectors on the disk, this value is not written anywhere in the MBR, you need a function to interrogate the actual drive. Luckily enough, MBRFIX by kaare smith does just that (between other things). Only problem is that it reports the size in bytes and the number is bigger than range allowed into "normal" batch scripts. Cannot say if Auto-it has better capabilities. [codebox] @echo off SETLOCAL ENABLEDELAYEDEXPANSION SET number=%1 IF %1.==. GOTO :EOF Set counter=1 :loop SET chars=!number:~0,%counter%! SET /A tempSECTORS=!chars! / 512 SET /A tempREMAINS="!chars! %% 512" IF !tempsectors! gtr 0 ( SET /A Firstpart=!tempSECTORS! SET /A charshift=!counter! SET /A remains=!tempREMAINS! ) Set /A counter=!counter!+1 IF NOT !chars!==!number! goto :loop SET LENGTH=!Counter! Set /A numremains=!LENGTH!-!charshift! Set /A counter=!numremains! IF !counter! ==1 goto :loop3 :loop2 Set /A firstpart=!firstpart! * 10 Set /A counter=!counter!-1 IF !counter! gtr 1 goto :loop2 Set /A counter=!numremains! :loop3 Set /A remains=!remains! * 10 Set /A counter=!counter!-1 IF !counter! gtr 1 goto :loop3 SET chars=!number:~%charshift%,%LENGTH%! SET /A secondpart=!chars!+!remains! SET /A secondpart=!secondpart!/512 SET /A sectors =!firstpart!+!secondpart! ECHO. ECHO !NUMBER! bytes / 512 = !SECTORS! Sectors [/codebox] that appears to manage the division correctly.... It can undoubtedly be bettered and simplified, should you need it. I'll try that against some of my disks tomorrow. Maybe we can use the size to create a growing virtual-disk with the quemu-tool. Once we got that we can use vdk.exe to add a snapshot to it. without needing all that Jave-environment. Vdk doesn't create REDOs for raw-disks - that's why the quemu-step inbetween may be necessary ? Hey - with some help from Nuno we may be able to run VMplayer on one of his miniPEs. I actually think that these "miniPE"'s actually do belong to the community since we all work on them.. I have no idea how the .script idea works yet. But I can prepare a VMplayer so that someone else translates it into the .script format - in case anyone is willing to do that. I guess that I may even get the OK from VMware to redistribute it if we build a clean package - which is easy to built. All I need is a small PE with solid network and explorer-shell. It may take a few weeks till I find the time to do that - want to finish the patchman first. Nuno - I made a first minipe last week and noticed that you use B: for the RAMdrive and format it with FAT322. Can this be discussed ? - It makes useing things that are easy on a NTFS-formatted RAMdrive as R: impossible. I would really like to adopt to your base-built for my MOA-stuff but this is definetely a No Go. 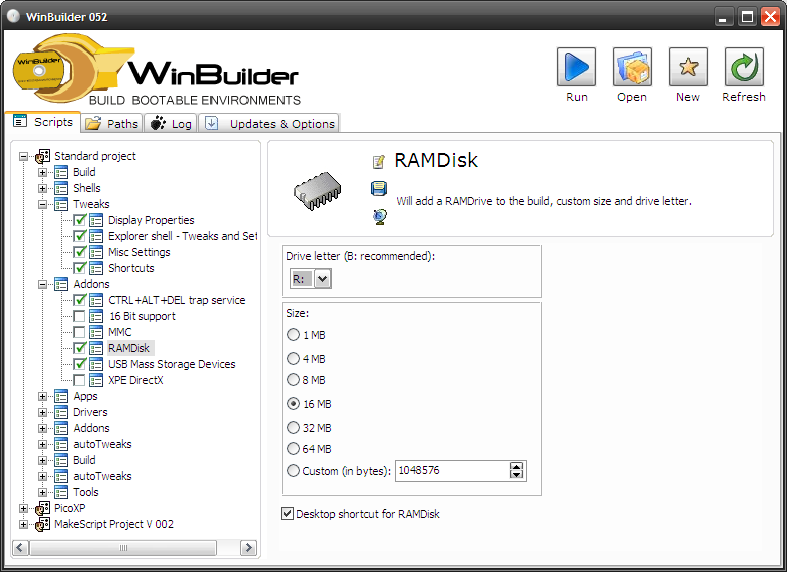 I hope that I simply missed something but haven't looked into Winbuilder closely enough to know. Can you comment - please. You should try out the latest winbuilder beta and check the projects inside, liveXP is still with some bugs, but I'm sure nativeEx should work flawless. ; You may turn this to &#34;zero&#34; , but then the ramdisk may grab all memory of that type away from other drivers. If you read closely the plugin code you'll see that it is possible to define the ramdisk to use NTFS instead of Fat32 - script work muck alike plugins, the difference is that you load and unload hives as needed and specify the keys to write. Perhaps the best way to learn is reading how Ove's ramdisk script was done - you'll see that it's easier than it looks..
0x2, "ControlSet001\Control\Session Manager\Environment", "temp", "%RamDiskDriveLetter%"
0x2, "ControlSet001\Control\Session Manager\Environment", "tmp", "%RamDiskDriveLetter%\"
I hope you don't read the next comment as arrogant or something like that - but I can't live with this. I think this is a design-error in BartPE - it limits your options. Why not use %temp% = %RamDiskDriveLetter%\temp ? In case I have very little RAM so that only an 4MB-ramdrive is possible - I simply junction R:\temp to a location on a local-disk or USB-traveldisk. It shows some things that are impossible on all other current popular builts - no matter wether it is BartPE - out of the box, UBCD4WIN, XPE, Reatogo, Winbuilder ... whatever. I'd rather continue fiddling alone with my MOA-stuff than adopting to any other builts that still still stick to the original design-errors. Please, please look into it - you will not regret it. Promised. It is already possible to use different drive letters on wb052- you choose..
On nativeEx and liveXP this is done on another part of the project, inside the "Define Fundamentals" script. Never needed to use NTFS before, but I see you take advantage of junctions so this might be a good time to use NTFS instead of Fat32, why not? Good - the screenshot looks different from what I tried - need to see what you are really doing as soon as possible.